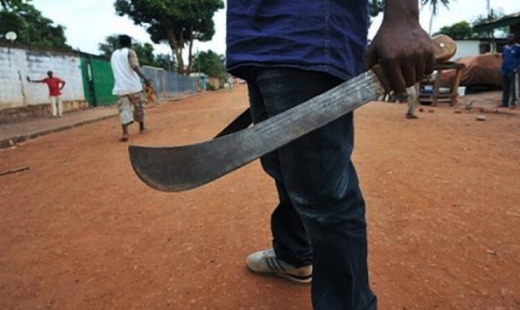 Home / Unlabelled / Notorious Lagos Cultist On Rampage: 5 Killed, Arrests Made . Notorious Lagos Cultist On Rampage: 5 Killed, Arrests Made . Residents of Alasiya in Abraham Adesanya Estate area, in the Eti-Osa area of Lagos State, were thrown into panic on Sunday as a suspected clash by rival cults left five corpses on the streets. The clash started around midnight, as two of the five corpses were beheaded. It was gathered that one victim was shot dead, another was slaughtered and the last one was butchered to death. The police were able to recover four corpses because the family of one of the victims refused to release his remains. A resident, Black Che, told The Punch that said he heard multiple gunshots around midnight. The Enugu State indigene said, “Last night, when we were inside the factory around midnight, we heard gunshots. But when we came out this morning, we saw five corpses. The police evacuated four corpses but the last corpse was not released to them, because the family of the person who was killed prevented them from taking his corpse away. “Two of the corpses that I saw were beheaded; another one was shot dead and his assailants slit his throat; another was slaughtered; and the last one was butchered. The corpses were dumped at different locations around the Alasiya bus stop. A security guard, Uka Kalu, said when he heard the gunshots around midnight, he immediately closed the gate of the company he was hired to secure, adding that he was surprised to learn of the death of five people in the morning. He said, “I was inside when I started hearing gunshots and the noise of people. I came out to observe what was going on. When I got outside, I asked the people I saw what was going on and what they told me was that some people who disembarked from a vehicle were the ones shouting. I immediately got inside and locked the gate. A welder, Isiak Adebayo, while condemning the rate at which youths were killing themselves in the name of cultism, charged security agents to restore normalcy in the area. The state Police Public Relations Officer, Bala Elkana, said four corpses that were probably dumped in the area were recovered, adding that the command had commenced investigation into the matter. “Four corpses were recovered from the scene of the incident and what we are suspecting is a cult supremacy fight. We have launched an investigation into the case,” Elkana said.